Keep the head strapped down! Supplied with 12 x Premium Nuts/Washers & Lubricant. ARP Head Stud Kit to suit all Ecoboost 2.0 and 2.3 engine. Obtaining the optimum cylinder head-to-block sealing is especially critical in small displacement engines employing high compression pistons or power adders like turbochargers, nitrous oxide and superchargers. That's why ARP® head studs are popular among leading Sport Compact/Import racers. You should know that ARP® uses a premium grade 8740 alloy that is rated far superior to "aircraft" quality. Then, each stud is precisely heat-treated to 200,000 psi. Following heattreat, each stud is centerless ground to make it as close to perfectly concentric as possible. This procedure involves about ten very slight cuts and results in an exceptionally straight part. It's important to note that lesser quality studs are not even centerless ground, the material is thread rolled in bar stock form (mostly before heat-treat, when the material is easier to machine). Because ARP® studs are manufactured to such exacting tolerances, you will note that gaskets and cylinder heads literally glide into position and are perfectly aligned, something that won't happen with inferior quality head studs. ARP® studs are thread rolled after heat-treat, which gives them about 1000% (that's ten times) better fatigue strength than those studs that are threaded prior to heat-treat. You will also note that ARP® offers specially undercut studs for several engines. This procedure (done only to the shorter studs) more equalizes the "stretch" of both studs, which makes for a more consistent clamping force, one that compensates for head gasket compression when the head is installed. This helps prevent blown head gaskets, and assures optimum sealing! Premium parallel ground washers are also included with each kit. Select from the drop down options on the side of the website. The Pumaspeed Workshop team are ready to fit the ARP Head Stud kit to suit all 2.0 and 2.3 Ecoboost in our Head Office located here. Therefore making parts and labour a total cost £850.39 (inc. VAT). 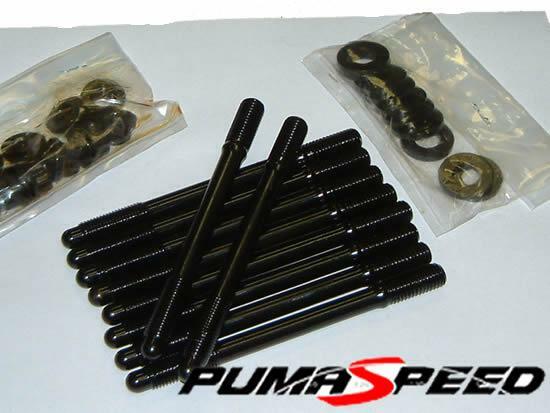 Pumaspeed have a specialist distribution team that can dispatch the ARP Head Stud kit to suit all 2.0 and 2.3 Ecoboost to any destination worldwide.